Course Detail: Basketry is one of the most useful, most beautiful and most varied crafts. 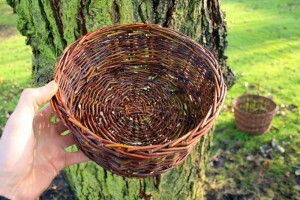 As well as being a joy to make; Baskets are practical and often essential for many Bushcraft activities. The timeless craft of basketry can sometimes seem daunting to the untrained eyes and hands. This course has been designed to guide total beginners step by step through each stage of the basket making process making it easy to understand. Participants will each make their own baskets learning the fundamental weaving techniques along the way. This course is appropriately taught in a peaceful woodland environment. Learning hands-on everything you need to know to get started with this diverse craft. Discount is available for larger group bookings.